Protein-rich sunflower seeds make healthy, irresistible snacks. To harvest the seeds from your own garden, cut the entire sunflower head down and set it to dry on a flat surface in a dry, dark place. Once the flower heads turn crispy brown, lightly rub them on the seed side of the flower to release the seeds from the flower. You’ll also find sunflower seeds at the grocery or health food stores in either shelled or unshelled forms. Cook either form of sunflower seeds for a fine snack. Spread the sunflower seeds on a cookie sheet in a single layer. Use two or more sheets for big batches, and switch oven positions midway through roasting. Look over the seeds and remove any stones, shells or debris. Place the sheet in the oven and set the timer to 30 minutes. Stir the seeds a few times during the cooking process with a wooden spoon or plastic spatula. Check the seeds after 30 minutes. If they don’t look golden-brown and crispy, set the timer for an additional 10 minutes. Pour 1 to 2 tsp. per cupful of seeds of olive oil, sunflower oil or melted margarine over the seeds. This step should only be followed for seeds which will be eaten within a day or two. Otherwise, the seeds may go rancid in storage. Season the sunflower seeds with salt, pepper, cayenne pepper, taco seasoning or the dried herbs and spices of your choice. Stir to evenly coat the seeds with oil and seasoning. Place the seeds on wax paper and allow to cool. Eat immediately, or put the seeds in an airtight container and store in a cabinet or the freezer. Add 1/4 to ½ cup salt. Add the sunflower seeds and turn the heat to low. Simmer the seeds for two hours. Drain the seeds and spread to dry on paper towels. Follow Steps 1 to 12 above to finish preparing the sunflower seeds. Use roasted sunflower seeds on salads instead of croutons. When baking, use them in place of raisins, almonds and other dried fruits and nuts in cookie, bread and muffin recipes. If you are watching your salt intake, lower the amount of salt in the recipe, or omit altogether. According to the University of Illinois, ¼ cup of sunflower seeds contains 200 calories, and are high in potassium, calcium and phosphorous. 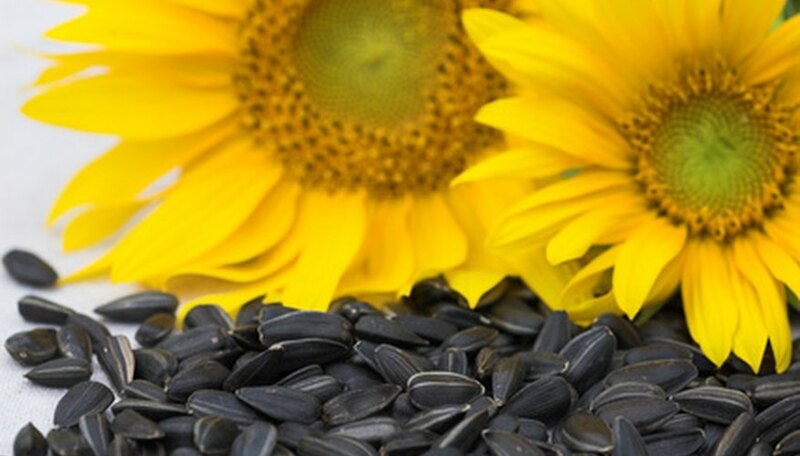 Sunflower seeds are the best food source of Vitamin E, according to the National Sunflower Association. One ounce of sunflower seeds roasted in oil provides 76 percent of the USDA's recommended daily allowance of Vitamin E, a noted antioxidant.